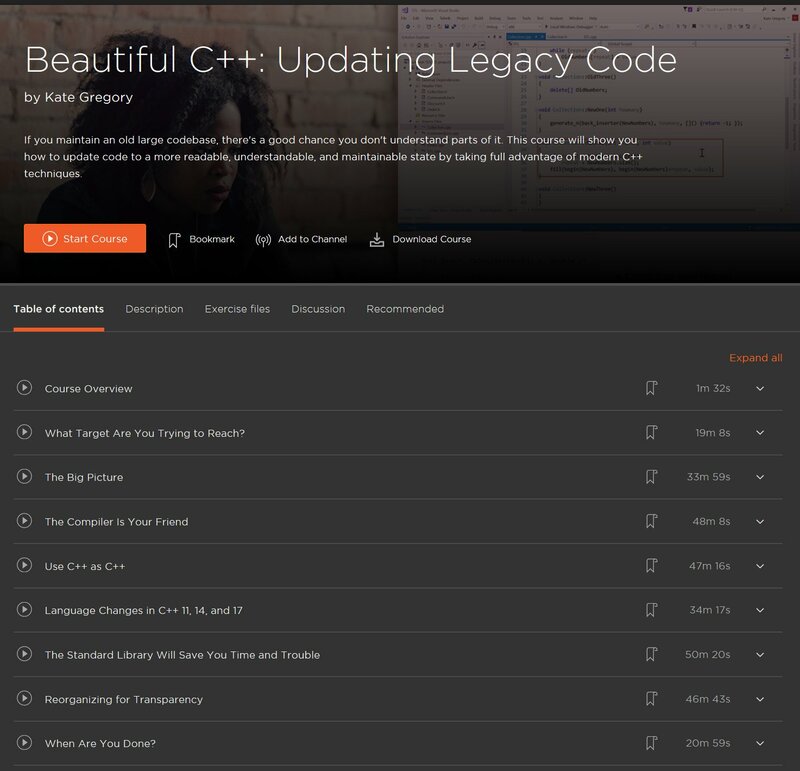 New Pluralsight Course: "Beautiful C++: Updating Legacy Code"
My latest Pluralsight course is live! I start by talking about strategy - what parts to update, what general approach to take, and so on. Then I present a number of specific tactics, like using the preprocessor less and the compiler more, actually using C++ instead of just C, and using C++ features that were added in C++ 11, C++ 14, and C++ 17. I show you code examples for the changes I am suggesting, and explain why specific changes produce code that is more readable, understandable, and maintainable. As always, if you don't already have a Pluralsight subscription, feel free to click the large white box in the margin and start a free trial. I hope you like the course, and tell your friends about it too! We need to talk about the word “guys” and whether or not it means people. Well, to be accurate, whether or not it means people to all the people who hear it. Here’s the thing: it doesn’t. Not to all of them. Maybe it does to you. I used to think it did to me. But now I’m not so sure it ever did. And for sure, there exist some people to whom it doesn’t. Take a look at this really non-scientific poll in which only “hey guys” was actually considered gender neutral: . There’s a whole section of the #include<C++> resources about the word “guys”. This is an adaptation of a sentence I heard to explain why average is not always a useful measure of a data set. I first heard it as “slightly less than one testicle.” When I told it to someone else, I substituted a feminine anatomical feature, and to my surprise, the man I told it to reacted very angrily. Since then, I’ve tried both versions of the sentence on various people, men and women (I haven’t tried it on the few nonbinary people I’ve met.) When you say testicle, everyone laughs. When you say ovary, women pause for a moment and then laugh. Some men laugh but most get angry. Why? Because people in general don’t have ovaries. Only women have ovaries, and when most people say people, they really mean men, who generally speaking are ovary-free. So this sentence includes a reminder that “the word people includes women and there are as many of us as there are of you.” Which upsets many men. And while they can’t explain their anger, it’s real. It’s actually a little scary. But it turns out, as WebMD says, “when it came to preventing a first heart attack, different trials got different results. Why? Studies that looked predominantly at men found that aspirin helped. Trials that looked predominantly at women found no effect.” Yet the general-purpose medical web sites are still advocating that “people” should do something that in fact is only helpful for men, rather than for people. So, if people means men, then even if guys also means people, it still means men. So we can argue whether “guys” is or isn’t gender neutral, but for an awful lot of both men and women, “people” isn’t even gender neutral. I think it’s fair to say, though, that guys is even less gender neutral than people. The key is this: you might mean to include women when you say guys. And most of the room might hear it as including women, too. But some of them will not. And you can’t tell who feels that way. So eliminating “guys” from your vocabulary will improve the experience of listening to you for some people. How can you do it? What can you say instead? Well in a lot of cases, you can just drop it. For sentences like “What do you guys think?” “What I’m here to show you guys today is” and the like, you can just use “you.” Sometimes you might want “all of you”. “Some guys think” can become “some people think” or get more specific – “some developers think”, “some managers think”, “some customers think” – you’re not only eliminating an irritant from your talk, but you’re being more precise and conveying more information. And you’re avoiding “people” which, as I’ve shown above, isn’t actually gender neutral to most of those who hear it. If you’re talking in the singular, this becomes even more important. “Some guy asked for this feature so it got added” or “you know somewhere the guy who wrote this is thinking” or “I need a guy from your group to take the lead on this” is just always wrong. Yet the more you say “guys” to mean “bunch of people of whatever gender, I don’t care about gender”, the more you will say “guy” to mean just one person, and those who hear you will hear gender. Instead, you can’t go wrong with “someone”, or again being more specific – the developer who wrote this, for example. The hard part isn’t figuring out how to reword the sentence to avoid the word guy or guys. The hard part is breaking the habit. I’m working on it, because I think it’s worthwhile. I encourage you to work on it too. Chances are, no-one will ever notice. That’s the thing about politeness and taking the time to be sure you’re not bumping someone with your elbow. No-one ever got off a plane and tweeted how great it was that the person next to them kept their elbows to themselves, or smelled ok, or was quiet. But it’s still worth taking the effort to be the great seatmate, and in the same spirit it’s worth taking the time to change your speech patterns a tiny bit so that some of your listeners don’t feel excluded. Win my ticket to C++ on Sea! Next year, I'll be keynoting a new C++ conference, C++ on Sea. I'm really looking forward to it. A little while ago, they ran a "tweet why you want to go" contest for a free ticket, and said that if the winner already had a ticket, the conference would help the winner give away the ticket. Choose a way to "give back" to your community before, during and after attending. This might be blogging, tweeting, hosting a local meetup where you talk about what you saw and recommend specific talks for others to watch later, or even activities at the conference like giving a lightning talk. If you're not on Twitter, post on my public Facebook page. You can't just email me because the idea is to promote those links to blogs, channels, meetups, and suchlike. That's it! I'll choose someone, probably by filtering to everyone who is offering to do something generous and then randomly choosing one, but I reserve the right to choose the single person who comes up with the most amazing plan. I'll tell the conference that you get my ticket. Fine print: this is just admission to the conference. Not travel or hotel. Not paid time off work. You'll need to cover that yourself. I suggest that telling your boss you won the ticket because of your community involvement might be quite helpful as far as that is concerned . And while I can't force you to keep your promise, I will remember if you do, and that will probably be a good thing for you over and above the rewards of doing those good things for the community. Submissions are still open so if you want to join me in Sydney as a presenter, get on that! I consider it an absolutely marvelous problem that there are so many C++ conferences I can't go to them all! There are a number of smaller conferences that draw primarily from one country or region, and more meetups than I can keep track of. I'm open to talking at a meetup if I happen to be traveling to a city for business anyway, but I don't think I can get up above 5 or 6 conferences a year, especially if some of them involve keynotes, plenary sessions, or workshop days. It's a lot of work! I'm really pleased with the result. If you've already taken C++ Fundamentals you probably don't need to take it again, but I hope you'll recommend to others that they take the new one. I think it makes learning C++ less daunting than some other approaches do. ps: don't have a Pluralsight subscription? There's a link over there -------> for a free trial. This year at CppCon, I'm doing a one-day pre-conference workshop. It's not just me, it's Andrei Alexandrescu, me, and Scott Meyers (everything at CppCon is alphabetical by first name, although for this particular triad we come out in the same order alphabetical by last name.) It's called Engage, Entertain, Educate: Technical Speaking that Works and that's what it's about. Because we're holding it the day before a conference, we're focusing on things you do when you actually get to the room and deliver your talk -- not on things like choosing a topic or writing an abstract. It's not a C++ workshop, though given who we are and who comes to CppCon, some C++ things are likely to be said from time to time. The focus is on technical speaking. You will get a chance (three chances actually) to deliver a fragment of a presentation and get feedback. You'll also see other attendees doing the same - their feedback is likely to be relevant to you - and watch some talks from us (and some of our colleagues) along with some meta talk about why we did it like that. So, when you register for CppCon, please consider attending our workshop, and booking your plane tickets accordingly. It's going to be fantastic. More and more conferences are making talks available on YouTube. I've decided to put the links on a playlist to make them easier for me to find. You can use it too! At the moment this includes 4 CppCon talks (2 in 2014, 1 in 2015, I missed 2016 for health reasons, and 1 in 2017), my Meeting C++ keynote, my Meeting C++ lightning talk, my ACCU 2018 talk on simplicity, and both parts of the Munich C++ Meetup version of the same talk. It's in two parts because we had a break in the middle for pizza. When more of my videos get uploaded, I'll try to keep the playlist up to date. Other recent appearances include episode 148 of CppCast.